In my Book of Shadows & Grimoire I say: "The Creative Forces of Nature are revered, with the Goddess and the God symbolizing the Universal Energy and Material from which comes all existence. The God and the Goddess are equal and omnipresent, for They are found throughout the Universe, the Earth, and all that dwell therein." Through life passages we travel to and from the Source of our existence in the Goddess and the God. 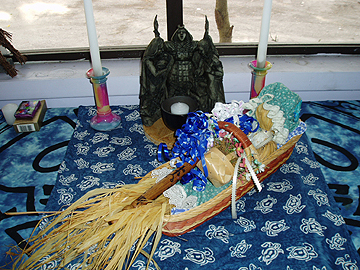 Reincarnation and communication with spirits are accepted parts of the religion, yet knowledge and learning are also embraced as the gift of the Goddess and the God. Magic is a natural means of working with natural energies to accomplish our goals, and readily becomes part of our natural life. The use of visualization, meditation, ritual, music, and dance may help alter the mind’s perception and awareness to aid in communication with the Divine and the magical process. Yet magic and communication can just as easily occur with ordinary conversation and a simple "knowing" that what you want will happen when you ask the Elementals or the Divine. The Dedication ritual keeps the pathway to communication is constantly open, and so should only be undertaken when a person is certain that the Old Religion is the path desired. Yet the Dedication experience can also evolve naturally without ritual, so that a person becomes "aware" of that connection when the time is right. 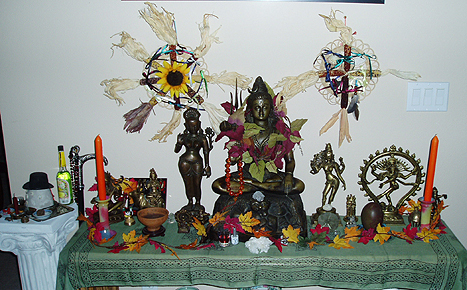 Here is an Altar setting with the Triple Goddess Brigid in the background and the basket at the center, with the Lady as the Corn Maiden and the Lord represented as the be-ribboned wand in celebration of the Imbolc Sabbat. 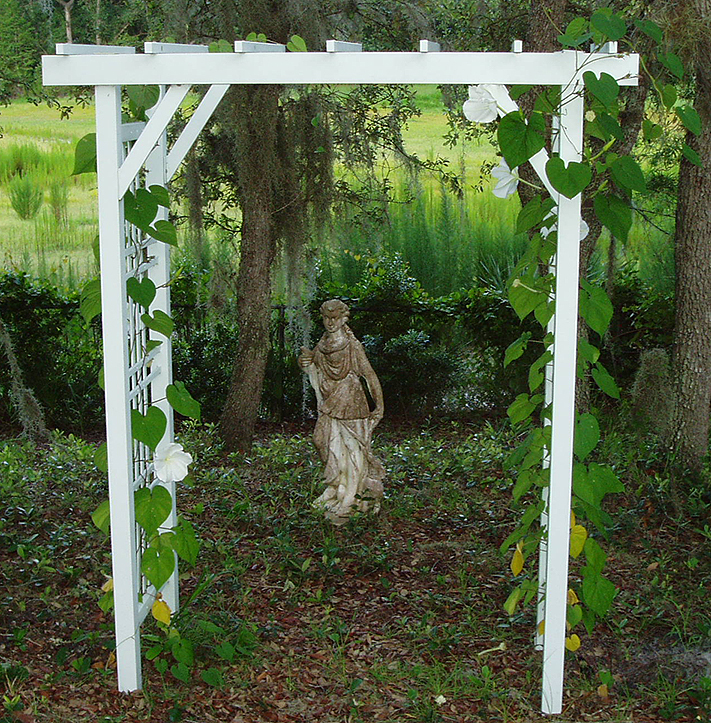 My statue of Diana is surrounded by 9 oak trees, and the little grove is entered through the trellis covered with moonflowers, which only open at night. She stands holding a bow in one hand, quiver of arrows on her back, and holding the leash of her hound with the other hand. The Crescent Moon is on her brow. Whenever I see Her, I think of magic and mystery.